The East and Roosevelt Volleyball teams held a fundraiser selling t-shirts for $15 to benefit Hurricane Harvey victims. Harvey caused chaos and destruction in Houston, TX from Aug. 17 – Sep. 3. Hurricane Irma devastated Florida from Aug. 30 – Sep. 16. The teams started selling the t-shirts two weeks before the East vs Roosevelt game held at East High School, both varsity teams wore the t-shirts during the warm-up. “The Salvation Army gives 80 – 95 percent of the proceeds to the people,” junior Kennedy Anderson said. More than half of the money the East and Roosevelt volleyball teams have raised will be going the people in need. “I was really happy we came together, and there was a lot of people at the game who actually ordered shirts,” Anderson said. 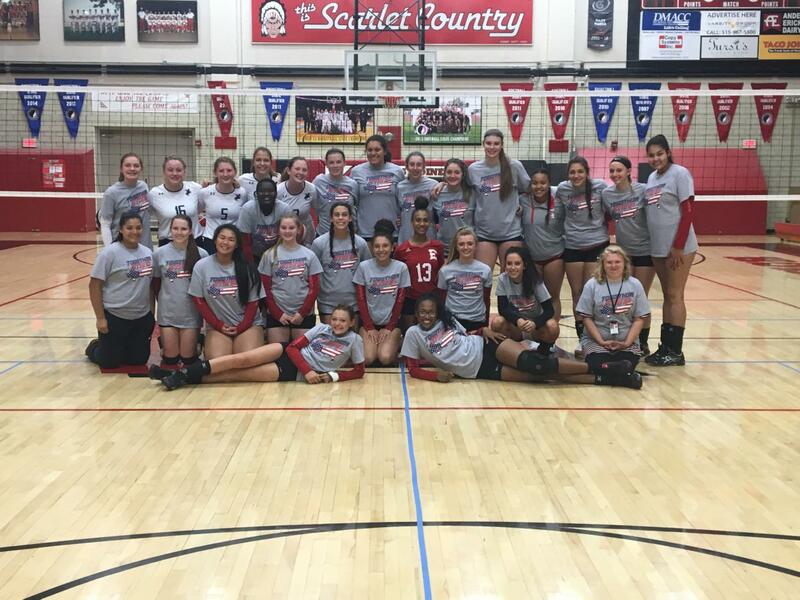 The support was evident when the teams found out how much money they had raised “$871 was raised through t-shirts and $80 was raised in the 50/50 raffle the night of the event” East volleyball coach Stephanie Clark said. This idea was brought up by Clark and the Roosevelt volleyball coach. They decided to do this because they wanted to give back to people in need at the moment and this was a big deal because lots of people were affected by this tragedy. “The girls did a great job and I’m very pleased with the amount of money they raised for those affected by the hurricanes,” Clark said. People were happy with the outcome of the shirts and mentioned to me that they were so excited to get them back. “I like the volleyball t-shirts because it gave people another opportunity to help the people affected by the hurricanes while also supporting our volleyball program,” Fitness teacher Ashley Forrester said.